If you are short of time, the answers to the following 3 questions should let you know all you need to about the 30 Second Smile (30SS) toothbrush. If I have missed something, let me know in the comments. If you want more detail, you can read the full review further down the page or watch our video review. No, there is nothing drastically wrong with this toothbrush. Some may question the uniqueness and approach, but it works far better than imagined, cleaning 3 surfaces, of each row of teeth at one time. Inclusion of a pressure sensor, an automatic power off feature and a premium travel case would be welcomed. This brush is somewhat unique and there isn’t another brush quite like it. There is Triple Bristle (although we are yet to test this) or Amabrush (which we have now tested but do not recommend over a conventional toothbrush), both of which offer the ability to clean 3 sides of the teeth at the same time. If you’re looking for a more general overview of current models, see the recommendations in our post on the top-rated electric toothbrushes. 3. Where is the best place to buy the 30 Second Smile toothbrush? You can buy it directly from www.30secondsmile.com or from Amazon. For international delivery to the UK, then head straight to 30 Second Smile directly. I should be honest and say that from the moment I heard about 30 Second Smile and saw the brush online I was sceptical. It is unique, could be considered as something a mad inventor might dream up in their workshop and certainly breaks the mould for electric toothbrush design as we know it today. But then again, Amabrush is unique and has just raised over €3 million ($3.4 million). What’s so unique about it? It cleans the front, back and biting surface of your teeth, at the same time. As intrigued as I was, my expectations were low, but how wrong could I be. 30 Second Smile is really impressive. Despite having tested many electric toothbrushes, from the first clean this was reaching parts of my mouth I clearly wasn’t with any other. No other brush has impressed me more out of the box to date than 30 Second Smile. If you head to 30 Second Smile’s website it is easy to become overwhelmed by the different options available. In truth, it is much less complicated and confusing as it looks. The ONLY difference between all of these is the brush head supplied. It is the same brush handle, features and box contents, with the exception of the supplied brush heads. This could be better explained on the 30SS website. Here are what I consider to be the pros and cons of the 30 Second Smile brush. Clean – Reaches more of the teeth and gums than you can imagine and highlights where you have been going wrong. Time – Saves you time without compromising your clean (clinically proven). Box contents – Reasonable box contents with charging stand and brush storage. Design/approach – As impressive as it is, its unique and many are unsure of it. Pressure sensor – No pressure sensor to alert you when you are brushing too hard. Battery – NiMH battery as opposed to a Li-Ion. Confusing brush range – The difference is the brush head, but you might think there is more to it than that given the number of options. Unique, scary, daunting, why and really are all words that people have remarked the moment I showed them the 30 Second Smile electric toothbrush. It is unlike anything that most have seen before and it takes a few moments to really get mind around the concept and how it works. You know how, with a regular manual or electric toothbrush you brush the front, back and then the chewing surface of the teeth? With 30 Second Smile, you clean all 3 at the same time! But you also brush the top and bottom row of your teeth at the same time too. This means you are cleaning 6 tooth surfaces simultaneously. Once you do, you realise how impressive and practical it is. When you come to use it, you also realise how poorly you have been cleaning your teeth, but more on that shortly. Take a good look at the images throughout this review to help understand and picture what the 30 Second Smile brush is all about. As I intimated in the intro to this review I was sceptical from the moment I became aware of it, but I feel I should eat humble pie as whilst it is certainly unique, you should not judge a book by it’s cover as the old saying goes, particularly when this is clinically backed. Talking of covers, the brush comes fairly simply packaged and whilst it is perfectly practical it lacks a few of the impressive design touches of the big brands. It has the key information on the box, but it doesn’t grab your attention quite like others do. But, packaging is not as important as the brush itself. Round/cylindrical shaped handles have been the trend for some time, but the handle of the 30 Second Smile (30SS) is different. It’s a slightly odd shape. It has a bit of an elliptical shape to it when looked at side on, but the font, back and sides are a flatter in profile. The colour and design is quite striking. The body is made from a gloss White plastic, with 2 Black rubber strips that run down the side of the brush handles. This is the only colour option for the brush, there is not the choice like there is with Oral-B’s Genius 9000 or Sonicare DiamondClean for example. The front and back of the handle look very similar with a 30SS logo placed in the upper third of the handle. There is then a large concave Black rubber grip in the middle of the handle, which is the point at which you hold the brush. Below this, on the back of the handle, is a strip of Black rubber that has ridges for grip. On the front are 3 LED’s that illuminate Blue. 2 are indicators of the speed of the brush when switched on, the 3rd is the battery status icon. Appropriate labels are shown below these LED’s. On the front side of the brush handle still is a smaller raised Black rubber button, this is the power button. On the base of the brush is a recess into which the prong on the charging stand fits. The brush does stand up, but either tilts slightly forward or back, depending on which way you position it. The base of the brush is not perfectly flat, meaning it has this slight tilt. At the top of the brush handle are 2 metal prongs. These are the shafts that connect to the motor, sealed inside the brush handle. The detachable brush heads connect to these, more on that shortly. Overall the handle is satisfyingly chunky and feels solid in hand. You can get a good grip on it, it is not slippy. The quality of the materials is fairly good. The design and finish of the handles from premium brands is better in my opinion, but this is far from a make or break issue with this brush. As you will see from the pictures, what makes the brush so unique becomes really apparent when you look at the brush heads. It is this setup that is essentially the magic of this brush. You attach not 1, but 2 heads to the handle of the brush. Each clips onto one of the metal prongs. The heads sit back to back. The brush should not be used with only one part of the brush head fitted. You hear a little click as the head clips on and to release you press the 2 buttons on the base of the brush head and lift it off the prong. You may notice one head sits higher or lower than the other, this is correct. The bristles are formed in almost a triangular formation. Your teeth fit into these bristle formations as you bite down onto the brush head. One head focuses on the top row of teeth and the other the bottom. Longer bristles reach down the tooth and onto the gumline as the bristles cup round the tooth. Shorter bristles in the heart of the brush head clean the tops of the teeth. You can’t use quite the same recommended cleaning technique when using this brush, more on how to use the brush in a moment. But, the bristles are angled perfectly at 45 degrees, the recommended angle at which you should brush the front and back of your teeth. There are a range of different brush heads available from 30SS, each helps different users with different needs. Each pack comes with the 2 attachments required for the brush to work correctly. Please be aware, that despite the different name the Teens Ortho and Ortho brush heads are the same as as the Kids Soft and Adult Extra Small and Extra Soft. So despite listing 7 different head styles, the reality is that there are only 5. The variant on test here comes with 1 set of extra soft and 1 set of extra reach standard soft brush heads. Included in the pack are a series of coloured stickers. These can be stuck on the body of the head to help differentiate the heads from another family member. It’s a nice little touch, but feels a slightly cheap approach. Oral-B’s coloured ring is a better implementation. Just like a normal brush head or manual toothbrush, you should replace the heads on the 30SS on average every 3 month’s. The Blue or Red bristles found on the brush heads do not fade over time as they do with Oral-B and Sonicare heads. Using the 30SS toothbrush is quite weird and it takes a bit of getting used too. It is an odd sensation and way to clean your teeth, but after a few days I got used to it and enjoyed it. You probably want to start by brushing in front of a mirror and be prepared to dribble a bit, I did, as I got used to how open/closed my mouth should be and how to handle the brush. It does look too large to fit comfortably in the mouth, but I had no issues at all. I could get it right to the back of my mouth and it felt like I was doing a better job of cleaning those back teeth too. Whilst you have to bite down into the brush heads, you need only do lightly. Within a few seconds you can find the right pressure and you will feel the brush glide with relative ease over the tooth surface. During brushing, whilst I found the approach odd as I got used to it, it was not uncomfortable. The same can be said of others who tried it. Once they did they were like WOW. Now I wish not to suggest I have the perfect brushing technique, but I would say it was better than average. Despite this, from the first clean I could feel the brush cleaning areas of my mouth better than other brushes, most likely because I have not been doing a good job of getting my brush into the right positions. I had not expected to feel quite such an immediate impact, but I did. What I could feel and also appreciate most was the angle of the bristles, I could feel them reaching onto and under the gumline. My teeth are fairly straight and there is enough play in the head and bristles to accommodate many different teeth and mouth types, but if you have particularly irregular or misaligned teeth it may not work as well. For those with dexterity issues, this brush could be really good as the amount of movement you need to make it limited really. The correct technique on how to use 30SS is best explained in their manual, which comes provided. Well worded and easy to follow it is one of the nicer brush manuals I have seen. Take a look at the following video to understand how you should use the brush. The brush has 2 power/speed settings available. Speed 1 or Gentle works at 850-900 strokes per minute whilst speed 2 or Intense operates at 1,100-1,200 movements per minute. This is a lot less than the 30,000 odd commonly promoted by Sonicare. Whether it is to your preference or not, the 30SS cleaning speeds mimic the BASS brushing technique taught in dental schools across the world. My personal preference was for the higher speed, but I am used to the high power Oral-B Genius 9000 electric toothbrush. Whilst I could certainly feel the 30SS cleaning areas of my mouth more effectively than I had been, I still personally feel like I get an overall better clean from the Oral-B brush. It feels more punchy and my mouth more refreshed after each clean. However, this is possibly because of the power of the handle and head, and is more of a placebo than a clinically accurate representation. To power the brush on you press the power button once and it launches the lower speed cleaning mode. Press it again and it moves to speed 2. Press it once more and the brush turns off. Built into the brush is a timer, it activates at 15 second intervals. Normally, a pacer kicks in at 30 seconds, but because the way this brush cleans, the whole clean only lasts 30 seconds. Where once the mouth was broken up into quadrants, with the 30SS you do it by halves. Brush the right and then the left side of the mouth. If brushing on speed 1, the brush speed increases slightly for about 1 second at 15 second intervals, whilst when on speed 2, the brush head speed decreases. You can see and hear this difference in speed. Unlike Sonicare and Colgate models this brush does not automatically power itself off and does continue to run for as long as you want. You turn it off when you are ready. Whether this is a good or bad thing, I found myself brushing for at least 45 seconds, if not a minute as there is something so appealing about brushing with this. Dental professionals recommend cleaning your teeth twice a day for 2 minutes, generally speaking that is the advice worldwide. However, the reality is that few actually brush for this time. Different studies conclude different results but in one, the average brushing time was just 37 seconds. This is far from sufficient time to clean the teeth effectively and it is in part why 30SS was designed. 30SS can cover 6 times the surfaces of a regular brush, so even if the brushing time is 37 seconds, more of the teeth will be cleaned. Your dentist would unlikely suggest it is possible to clean your teeth effectively in 30 seconds, but it is possible. Update 11/1/2018: In response to my review comments 30SS have provided additional explanation to the cleaning time. New approaches like the one 30SS takes can be questioned clinically, so what makes this brush particularly special is that at least 1 clinical study has been conducted with it. Now, this might not be the most in depth study, but it is a step in the right direction and confirms the benefits and confirms this is not just a gimmick. The aim of the study, completed in 2015 by J Kobi Stern et al was to see if you can improve gum health in less time when brushing. The short answer is Yes, you can. The study found, using the Hydrabrush/30 Second Smile toothbrush twice daily for only 30 seconds, can be equally effective as a conventional electric toothbrush used twice daily for 2 minutes, in improving gingival health over time. The results were not such that the world of dentistry is going to change overnight, but the results were good enough to suggest that as part of a good oral healthcare routine the 30SS is not inferior and can be considered as an effective tool. If you are one of those that don’t or barely brush because you simply don’t rate it as important, or are always short of time, could just 30 seconds with the 30SS brush be the answer?! To make it an even more effective tool in my mind would be to include a pressure sensor. Whilst the approach is different, it would be great if there was some sort of system to better alert users to the best pressure/bite when cleaning. A bite stop is really not necessary with 30 Second Smile because the arms or flexible and simply move when biting too hard. That’s actually another feature of 30 Second Smile. With ordinary toothbrushes, the amount of pressure applied to the tooth surface is 100% dependent on the force applied by the user. With 30 Second smile, the correct/safe force is applied to the tooth surface automatically and thus not dependent on user skill. Unlike some new models from other brands there are no smart features such as Bluetooth connectivity, brush head reminders or customisable LED lights. 30SS is focused on delivering a good and effective clean with the innovation being in the approach rather than other features. Supplied with this brush, is a brush head stand and charging station. Larger than just a basic charging stand, but kept as compact as it can be the unit has spaces for 2 brush heads to be stored within it. There are 2 slots on the right and left side, and then an opaque lid that closes over the top to protect against, dust, dirt and debris. Centrally positioned, but not enclosed within the lidded compartment is the charging stand in which the 30SS brush handle fits. It mounts either way around and shines a Blue LED from the handle when docked and connected to power. Running from the dock is a power cable of about 1 meter in length that connects to the power socket. Being a US brush, it comes with 2 pin US plug, but supports 100-240v. This means you just need an adapter to connect it to UK or European mains power. Plastic in construction the unit is lightweight and has 3 rubber feet on the bottom of it. Also supplied in the box is a plastic tongue scraper. Basic, it does the job and is a nice addition, particularly as many do not understand the importance of cleaning the tongue. Also included is a travel pouch. It looks like an oversized plastic and clear pencil case. It does nothing more than provide a place to store the handle and the heads together. I would strongly advise picking up the optional hard travel case which is more robust and more functional, protecting against accidental activation and possible brush head damage. Another optional accessory is a UV Sanitiser. It is similar to the supplied charging unit, the difference being the compartment that the brush head sits in has a solid lid and UV bulb inside. When the button is pressed a UV cycle is run to clean the bacteria and germs off the brush head. We’ve covered this in more detail in our post on the best toothbrush sanitizer. The handle is sealed and should resist water, toothpaste and saliva just fine, but 30SS do not advise using in the shower. A quick rinse under the tap to wash off any much should be fine, but worth towel drying to avoid prolonged exposure to moisture. Built into the handle is of course the battery, the power source the heads and keeps this brush going for a couple of weeks. It is a Nickel Metal Hydride battery as opposed to the more common Lithium, but more on that in the battery section of the review. As you might expect, the brush is warranted against any issue that might occur within the first 2 years of ownership. Full details of this warranty are available here, as are details of their 60 day money back guarantee, which is a nice touch. Also good, is the $5 credit you get if you register your brush with 30SS, which you can use against replacement brush heads. The brush is just so different, it’s one of a kind and deserves more attention publically, for the benefits it brings. Parents who struggle to get their kids to brush their teeth at all could find solace in 30SS. More head to head testing is needed with other brands, particularly in a clinical trial setting. You don’t need to switch unless you buy into the benefits or you think it will help you brush better or for longer, but for many reasons, many will stick with their tried and tested brushes and I can understand this. Inside the brush handle is a Nickel Metal Hydride (NiMH) battery as opposed to the generally more popular Lithium-Ion. 30SS claim they have specifically stayed clear of the ‘potentially dangerous’ Lithium batteries. Any battery has its pros and cons. To be honest, I think there are more pros for lithium than there are for Nickel Metal Hydride, but it is what it is. Update 11/1/2018: In response to my review comments 30SS have provided additional explanation of why NiMH is their choice of battery. We use Nickel Metal Hydride batteries which are generally considered safer. Lithium batteries have on many occasions (as you have heard in news stories) exploded in cell phones and other products. They require additional electronics within the charging apparatus to make sure they do not over-charge and hence explode. We simply don’t want to take that chance. Since we use 3 battery cells vs. 1 used by competitors, we have a bit higher voltage and thus more brushing power. Lithium Ion batteries MUST be deposed of properly due to dangerous chemicals within. The Sonicare box clearly states that their lithium batteries MUST be recycled and disposed of properly. However, proper deposal rarely happens because they don’t make any effort to explain how to cut into the handle to retrieve the batteries to dispose of them properly. There has been some speculation of the possibility of not allowing products with lithium batteries on airplanes. That would present a very big inconvenience problem for many people. We don’t want to take that chance. The bottom line is that our Nickel Metal Hydride batteries are completely safe and in the 3-pack provide more power, and no longer have the memory issues formerly associated with non-lithium batteries. Given the short cleaning time, even a smaller battery will last a comparably long time. For every 2 minutes offered by a regular brush, you are getting 4 cleans from a 30SS. With many Nickel Metal Hydride battery brushes offering 5-14 days the battery life of 7 weeks is not all that surprising. On their website they claim 3 weeks battery life which is 21 minutes of brushing time or 42 cleaning sessions or 21 days. However our own hands on testing has revealed when run on speed setting 1, the brush lasted 54 minutes, which is equivalent to 54 days of brushing, 108 cleaning sessions or over 7 weeks without needing to recharge. To recharge the brush, you should sit it on the supplied charging stand. The stand itself has a hardwired cable running from it, that connects to the power. This cable has a 2 pin US mains adapter on it, as this is a brush currently designed for and sold in the US. To use it within the UK you need a power adapter. You do not need a voltage adapter, because the charging stand itself supports 100-240v. Connect it to the mains power (with an adapter if required) and the brush will take about 10 hours to charge fully. When on charge a Blue LED will shine. It is perfectly safe to leave the brush on charge when not in use and you need not charge it for a full 10 hours before you use it. The price is $129 for any of the different variants of this brush. This is certainly not the cheapest, nor is it the most expensive electric toothbrush and given the unique nature of this product, I don’t think it is a ridiculous price. 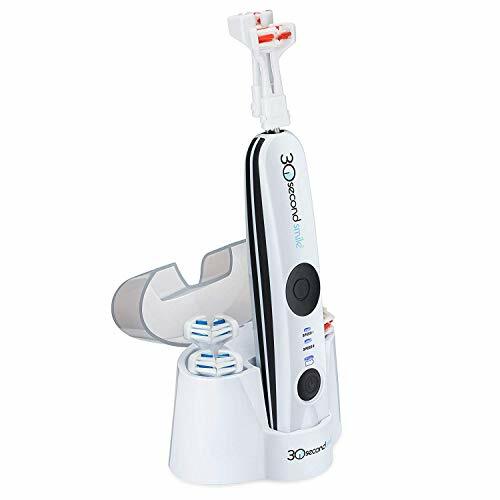 It is without doubt more expensive than the most basic electric toothbrushes available on the market and $40 could get a similar standard electric brush. A set of brush heads cost $12. This is roughly $5 more per head than an Oral-B brush head for example. Pricing the brush over a 3 year period which is typical for us at Electric Teeth, you are looking at a total ownership cost of $261 or 24 cents per day. A normal brush might cost somewhere in the region of $0.10-0.15 per day, so a lot less. But overall pricing and comparison to typical electric toothbrush is a little like comparing Apples to Oranges, it’s not exactly fair to make direct comparison. With a normal toothbrush you spend 1460 minutes (24.3 hours) a year brushing your teeth. With 30SS this is reduced to just 365 minutes (6 hours). 18 hours less time, can you put a price on this?! 18 hours saved could be very well spent. For the sake of example, the time saved was put into working. You earn $20 an hour, that’s an extra $360 a year, for a brush that was perhaps $90 more expensive. You are still up $270. If you have read any of our other reviews, as best as possible we really do test the brushes we get in. Now, we do not have any expensive lab equipment, afterall we are normal brush users like you. The difference is we have handled many different brushes to make comparison to. 30SS gives us no immediate cause for concern or reason to doubt the ongoing product quality. The in hand feel of the product is not as classy or premium feeling as the Sonicare range, but not far off. To be fair to Hydrabrush, the brand behind 30SS, they do not have the resources, experience and money of these global brands. More than satisfactory is the standard, but small details and touches are noticeable from the big brands. Whilst there has previously been some quality issues these have been resolved having moved production plants and for the weeks we have been testing this brush there have been no issues. For peace of mind, the brush comes with a 2 year warranty. This covers any 30SS brush to be free from defects in materials and workmanship for 2 years from the original purchase date. Should the product have a defect in materials or workmanship, they will repair or replace it without charge to you (a shipping and processing fee will apply). This warranty does not apply to replacement products given from the date of purchase until the end of the warranty period. Product replacement does not lead to an extension of the legal warranty period, nor does it lead to a renewal of the original warranty. One key point to note is that the warranty is void if the product is used in the shower or other exposure to running water. Most other brands are not this strict, for a brush will inevitably come into contact with water at times. Other brands allow the brush to be used in a shower for example, best avoid that here. Despite looking very unusual and perhaps being a little daunting to use, the 30 Second Smile electric toothbrush should not be written off. It does take a bit of getting used to, but within a few days you can master the approach. It will not be for everyone, the size, design and technique will be questioned by many. Your dentist will always be sceptical, unless they have used and tested such and I won’t blame you for sticking with the tried and tested approach. 30SS favours those that are always in a hurry and know they don’t give their teeth the attention they deserve. Those parents who are facing an uphill battle to get their kids to clean their teeth and for those who like something different. Clinical studies and my own hands on time has confirmed that the brush works and does a good job, with it being perfectly possible to achieve a like for like clean in a quarter of your normal brushing time. It is not perfect. A pressure sensor would be a nice addition, the quality could slightly higher too. However, having tested lots of toothbrushes, I have never been as impressed or had my expectations exceeded in the way I have with 30SS. I don’t think this will be leaving my bathroom anytime soon. Is the 30SS oscillating brush? The handle offers one cleaning mode, the standard clean mode that can be set at one of 2 speeds. The bristles sweep at 850-900 on speed 1 and 1,100-1,200 on speed 2. Does the 30SS have a pressure sensor? Does the 30SS have Bluetooth? Does the 30SS come with a warranty & how long is it? Yes, it comes with a 2 year warranty. Does the 30SS have a built in timer? Yes. It has a 15 second timer that indicates to change the half of the mouth and when to end the clean. The 30SS charging station has not been designed to be fixed to a wall and should sit on a flat surface. Can I use the 30SS in the shower? No, it should not be used in a shower. A basic travel pouch is included. There is the option to upgrade to a hard case that is much more useful. Do you own or have you used the 30SS electric toothbrush? The Hydrabrush/30 Second Smile brush spoken about in this review was provided by Hydrabrush PR department. Electric Teeth did not purchase this model. No financial reward was provided to conclude the review the way that we did. Thanks again for your amazingly In-depth review of the 30 Second Smile toothbrush, and for putting me in touch with the company. I currently use a Sonicare, but am really interested in these newer designs which claim to make proper brushing technique easier to achieve consistently. (I initially found your site while researching the Y-Brush; it’s fascinating, but doesn’t seem quite ready for prime time.) I know you have not yet reviewed the Triple Bristle sonic toothbrush, but it has received hundreds of excellent reviews on Amazon and I wondered if you had any initial impressions about it. I realize an electric toothbrush is not a lifetime investment, but I’d like to make the most informed choice possible, and your reviews are by far the most thorough and authoritative I’ve found anywhere online. I have not yet reviewed Triple Bristle, you are quite correct. It is on our list of ones to review, in fact they said they wanted to send me one, but it has never arrived (read into that what you will). From what I have seen and read, its going to be comparable to 30 Second Smile. It gains appeal as it is significantly different to a regular brush, hence the positive reviews. But, given both are unique my initial impression is why not side with 30 Second Smile as it actually rows both rows of teeth at the same time. Habit, personal preference and perhaps the more proven track record of the likes of Oral-B and Sonicare brushes means that 30 Second Smile is not a daily brush from me. However, I do honestly retain this in my bathroom and use it every week or 2, many months after reviewing it, as I really enjoy ensuring I am getting every part of my teeth and gums. I have found that it does sometimes cause a little gum bleeding, which means I have been missing or not cleaning properly with my regular brush, so it does many things right for me. Triple Bristle, from the images alone does look a bit ‘cheap’. What I mean by this is the plastics look potentially a bit lower grade. I have nothing to back this up, not having handled it yet, but hopefully you know what I mean. Oral-B and Sonicare will always get your dentists approval. 30 Second Smile will get probably a bit of an odd or disapproving look from your dentist. However, the very fact you are taking this time to research toothbrushes shows your interest and likely the attention you pay to your oral health, thus you may want to give it a go. The big brands have the money for clinical trials and marketing might, but that does not always tell the whole story. I hope this extra insight helps. This is super-helpful! I’m going to give 30SS a try. Thanks again! Thanks for your excellent reviews! The coupon code for the 30 Second Smile no longer works, which is a shame since I was willing to give it a try for the reduced price. Oh, well, I think I’ll continue researching the Y-Brush instead. I will turn the code back on tomorrow or you can email me at rebecca@30secondsmile.com. Please give us a call at 800-431-1902 and we can take care of you and offer you the 25% discount off entire order offer. You can speak with Karlene and let her know you would like the teeth6 discount. Or, email me at rebecca@30secondsmile.com.